The Marine and Aquaculture Program supports the viability and environment of Marin’s coastal communities by improving aquaculture production and bringing scientific understanding of marine ecosystems to important community and policy discussions. These contributions are made possible through support from the California Sea Grant. 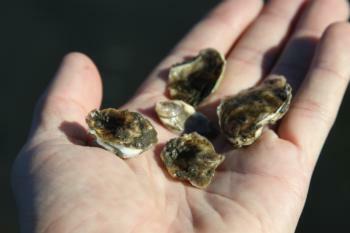 The UC Sea Grant Marine Science team collaborated with local oyster producers to evaluate the production benefit of an oyster seed from Taylor Shellfish Farms, which is a cross from robust broodstocks. This work is being done to find seed stock that is resistant to summer mortality and resulting production losses. Results over the first two years of the trial indicate an increase in production by as much as 8%. The trial in Tomales Bay compliments similar trials in Morro Bay and northern San Deigo. UC team members and local oyster growers will continue to evaluate this new seed stock for its fit with local conditions.